Flash tutors created with the Flash components require you to set a tab order. A tab order is the order in which "focus" is given to each component in the tutor when the user presses tab or enter. You set a tab order by specifying a numerical index for each component. Focus occurs in numerical order, starting with the lowest index number. After focus reaches the highest tab index, it returns to the lowest index number. In the Flash IDE, select View > Show Tab Order. Tab index numbers for individual objects appear in the upper-left corner of each object after you assign them. Select Window > Properties to display the Properties panel. Select a component to which you want to assign a tab order. 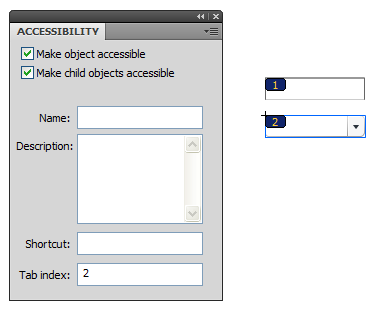 In the Tab Index field of the Accessibility section of the Properties panel, enter a positive integer (up to 65535) that reflects the order in which the selected object should receive focus. For more about tab order as it's generally used in Flash, see Adobe's Help page on the topic.